Home » Inspiration » If I’m a Good Mom, Why Did Things End Up So Bad? If I’m a Good Mom, Why Did Things End Up So Bad? My 6th and 8th grader wanted to go on their annual youth group Tu B’Shvat trip, so I was a good mom and signed them up. That meant that yesterday my 1st grader, Yaakov, didn’t have any older siblings to bring him home from school. So I was a good mom and took an hour out of my day to pick him up myself. And then Yaakov didn’t want to leave his school, because he was playing soccer with his friend. So I was a good mom and read my magazine and let him play for another 15 minutes. By the time we left his school, I only had half an hour to pick up 4-year-old Yoni on time, in a different neighborhood. But I would be a good mom, and pay extra to take a taxi instead of the bus. But my phone started acting funny and I couldn’t call for the taxi. Anyway, Yaakov preferred to take the bus. So, like a good mom, that’s what I did. And on the bus home, I gave Yaakov the snack I had brought for myself. What a good mom! And then, when we were almost there, the street suddenly turned into a parking lot. So, like a good mom, I got off the bus and started walking as quickly as I could to Yoni’s gan. And I did what I do when I am running late. I don’t look at my watch, and I envision that I am arriving on time, or at least almost on time. And a revealed miracle took place. Like when Hashem shortened the long journey for Yaakov Avinu. And I arrived at Yoni’s gan at exactly the right minute. Not even a minute late! What a good mom! So why did Yoni’s teacher look a bit upset with me? And then I saw Yoni, his little brown eyes pink with tears, round with worry. I was a good mom!! So somehow I got past Yoni’s roadblock. And somehow I distracted him with a promise of something yummy to eat at home (he wasn’t so happy when he found out the surprise was lentil soup). And on the walk home, I couldn’t shake my deeply unsettled feeling. How was it that I had done everything possible to make sure my kids would be happy, but in the end, they weren’t? And then I noticed the other mothers also returning from pick-up time. I see that mom who rushed back to pick up her 4-year-old and year-old after a full day at work. Her company recently announced it will be closing this summer; she doesn’t know how she will be supporting her 8 children. And I see another mom surrounded by her 5 kids, the newborn in the carriage crying, the 2-year-old having her daily tantrum while the mother yells after the 4-year-old who was running way too far ahead. And I see that mom whom I saw snapping with fury at her husband last Shabbat. I just noticed they are in the middle of renovations, added stress on top of everything she already has to balance with 3 children under the age of 6. Juggling so much, all of us moms, all of us yearning to be good moms. When the most any of us can hope for is good enough. Remind yourself of the truths you surely know deep inside. Your worth as a mother is reflected in your efforts, not in the results or in the appreciation. The best gifts you can give your children are the ones concealed in the wrapping paper of patience and trust. The only One who who can appreciate your true worth is the only One who really knows you. His appreciation is strengthening and encouraging. Everyone else’s appreciation is nice but is necessary only for their good middos development. No need to attach your self-esteem to such fleeting recognition. Hatzlacha! Maybe we need to use a sliding scale. Not good enough slides to good enough or even to great mothering. It is not easy bringing up children, especially a lot of children. Most of the Moms you describe and I see, work hard at being good Moms. Slide the scale to a higher level, a better result, a truer bigger picture. These are individual incidents on one day. One day does not make a life time. Wait til you see the results – grown and caring children, who appreciate their Moms and Dads. And even if they replay what you wrote about when they are parents, they will also become good parents. Children have no idea what it takes to be a parent, but they will realize it, if not now, later when they are older. Our goal is NOT to become a “good mom” but to become a WISE mom. In the long run, nobody truly benefits when a parent runs him/herslf ragged trying to please everyone, including their two year old. Children thrive when an adult sets perimeters. Good or bad are value judgements. The only measuring stick by which we make value judgements is Torah. I have no training in child psychology so this is purely something I’ve come up with but I feel that sometimes the crying and “unhappiness” in children is what allows for good parenting. 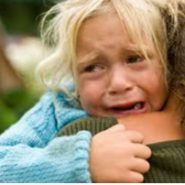 It allows them to communicate negative feelings and for parents to respond in a safe, emotionally healthy manner. That’s how you learn to be emotionally healthy and also communicate needs in a healthy effective way. If they were always just happy you’d never get to reassure them that you WILL pick them up, that you are there for them, that you do take them into account etc. Great insight, Karen. Reminds me of a joke with a deep message. There was a little boy who still wasn’t talking at the age of 5. The pediatrician found no reason for the delay and told the parents that in all other aspects of development he was fine but the parents still worried. “Until now everything was perfect! !” came his answer.